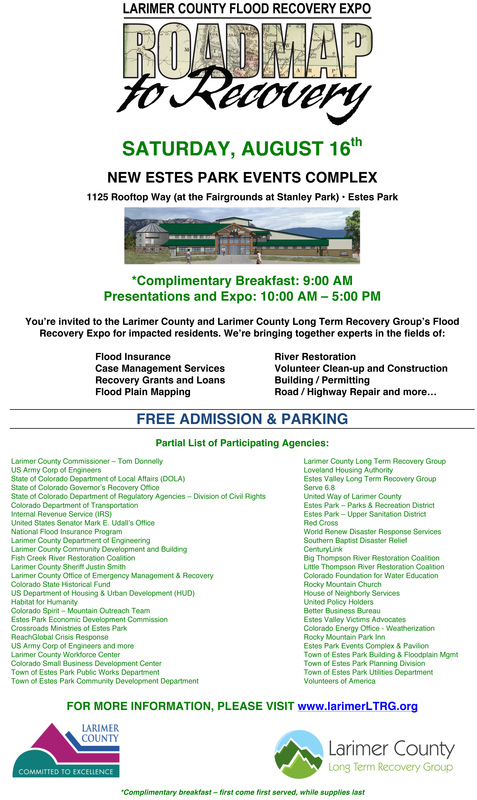 The Larimer County Recovery Group (LTRG) in partnership with Larimer County hosted an all-day flood recovery expo on Saturday August 16th, 2014 from 10 am - 5pm at the brand new 25,000 square foot Estes Park Event Center and Pavilion located at 1125 Rooftop Way, Estes Park. In September 2013, more than 300 homes were significantly damaged and more than 40 homes were destroyed in the Larimer County floods. The county also suffered massive countywide infrastructure and road damage. The “Roadmap to Recovery” Expo included presentations and updates by the Governor Hickenlooper’s Office of Recovery, Larimer County Commissioners, State of Colorado Department of Local Affairs, Loveland Housing Authority, and many other federal, state and county partners leading the recovery efforts. Larimer County will provide recovery information on road and bridge repair, floodplain impacts, building permits and code requirements for those needing to rebuild their homes. Volunteer groups who have contributed tens of thousands of man-hours will be thanked in addition to the many first responders who continue to be so vital in their communities. Many of them are also volunteer firefighters who are also flood survivors. In addition to the presentations, residents were able to visit trade-show style booths featuring dozens of other community organizations that can answer questions and provide resources. Topics range from municipal updates from Estes Park and Loveland, construction, river restoration, volunteer resources, economic development and small business resources and disaster case management services.